Simon says. "Simon says" - a Simon Baker वॉलपेपर created द्वारा TheCountess (with reference to his character on The Mentalist). 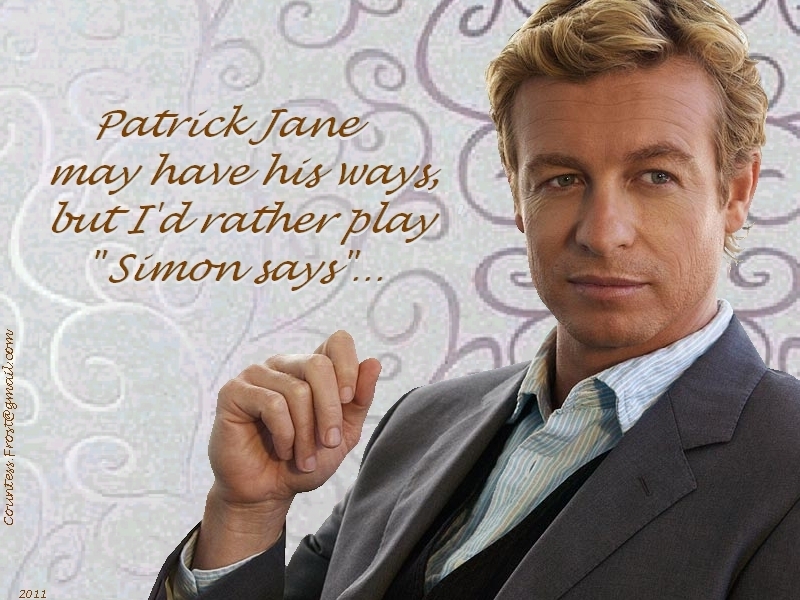 HD Wallpaper and background images in the साइमन बेकर club tagged: simon baker actor patrick jane the mentalist tv show fan art wallpaper thecountess. This साइमन बेकर wallpaper contains बिजनेस सूट, सूट, and कपड़े का सूट. There might also be पिनस्ट्रीप, pinstripe, थ्री - पीस सूट, तीन पीस सूट, अच्छी तरह से तैयार व्यक्ति, सूट, पैंट सूट, pantsuit, पैंट्सट, and अच्छी तरह से कपड़े पहने व्यक्ति. He just may be my favorite Australian actor. Have you seen Simon in anything besides The Mentalist? I'm afraid that's the only place I'm familiar with him from - at least so far.